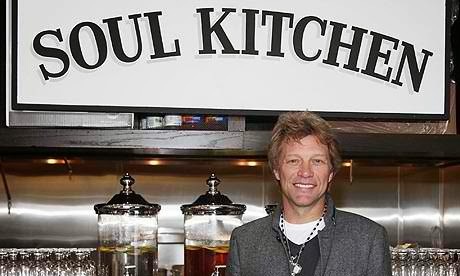 The Soul Kitchen is Bon Jovi’s charity restaurant is a unique restaurant for those who would like to eat with or without money in the pocket. The good thing about this restaurant is that you are free to it and there is no price for every menu. For those who cannot afford to pay, they are free to do service like washing the dishes, wiping the table, cleaning the counter, etc. My reflection for this story is that there are so many hungry people in the world and sometimes we fail to share what we have. We have abundant food in the kitchen and while we are eating our best meal, these people are eating their worst meal. Bon Jovi has my respect because of this. His restaurant reminds me that every life is important and sometimes you only have to exert a little effort to eat. Bon Jovi has the heart to serve though it is not proper to dole out everything in order to maintain the status of the restaurant. No matter what angle you will look at, this has a positive effect to people. The people that the restaurant has fed will soon remember Bon Jovi’s kindness and eventually this rock star will be blessed. Whatever we do with others, they will come back to us even in the most abundant way. If all the restaurants in the world are like this, I bet there are so many lives that will be saved. There will be peace on earth and hungry mouths will be fed.